The renowned US law directory Best Lawyers® has recognized 17 partners of Raue LLP in its Ranking „The Best Lawyers in Germany 2019“ as outstanding lawyers in their fields, three of them additionally as Best Lawyers® 2019 “Lawyer of the Year“ in Germany in their fields of work. Raue partners Dr. Klaus Goecke, Dr. Stephan Koch, and Dr. Maren Bedau have been included in the Best Lawyers® Ranking for the first time this year. Best Lawyer® titles are awarded solely on the peer recommendations of leading colleagues in their respective practice areas. 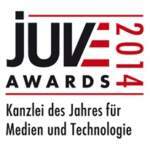 Best Lawyers publishes the results in Germany in cooperation with Handelsblatt.